recommended for: Fans of The Unquiet by Mikaela Everett, Illuminae by Amie Kaufman and Jay Kristoff, and other dark, morally complicated sci-fi. The premise is fabulous. The United Nations has decided to take the children of world leaders as hostages to promote peace. Wage war, and your kid gets the axe. It's an extreme but plausible near-future and Bow plays around with the mechanics of it in fun and tragic ways. Oh, did I mention that this whole thing is orchestrated by a massive omniscient hyper-intelligent death robot? F**k with his system and he'll rain nuclear winter on a few of your towns until you get back with the program. Also, his biblical-esque "Utterances" are hysterically sarcastic. Like AIDAN from Illuminae? Meet Talis, his extra-murdery counterpart. I didn't actually mean for the hostage thing to create a whole bunch of hereditary monarchies. But, you know, whatever. Murdering princesses. I can work with that. The people who run the hostage compound are robots. Greta, our hero, is a cold, clever knife of a girl. She's teacher's pet, prim and proper, but as brutal as a tornado-swept field, and as gentle as rabbit fur. She's a bit aloof and hard to get to know, unless you also happen to be a bit aloof and hard to get to know, in which case you'll feel like you're reading about your own personal thoughts. The cast is complex and well thought-out, flawed and faceted. Da-Xia is beautiful and serene and imposing, Elian is frenetic and strong and scared and impulsive, the Abbot is protector and tormentor. There's a lot of human feeling running about, a lot of fumbling kisses and confused loves and betrayals and moments of courage. The writing took some time to get used to. Clearly they teach 1900s English at this school, because everyone talks like a less dandyish version of Oscar Wilde, aka like there are many sticks up many butts. It seems artificial, but you get used to it--and it kinda makes sense, given they're mostly royals and apparently talking like a robot is protocol. It's worth it to stick with, because Greta's narration is unabashed and darkly funny, with truly beautiful moments tucked inside. But it maybe makes the characters feel a little far away. The plot is a little slow. Probably I'd have rated it higher if the pacing had been better. The twists are pretty damn cool (that ending! ), but the spaces between them are too drawn out, too meandering. Also, I wanted more Utterances. 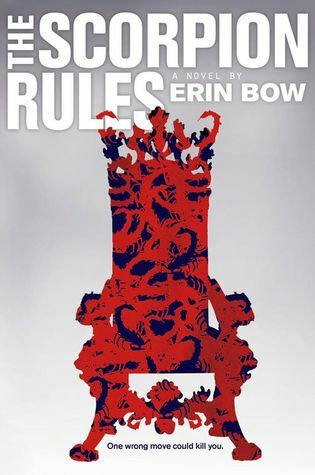 The Scorpion Rules is a richly imagined near-future sci-fi that pits logic against emotion, humanity against humans. will i continue the series? I'd probably rent this or borrow, but I would like to see what happens at some point.